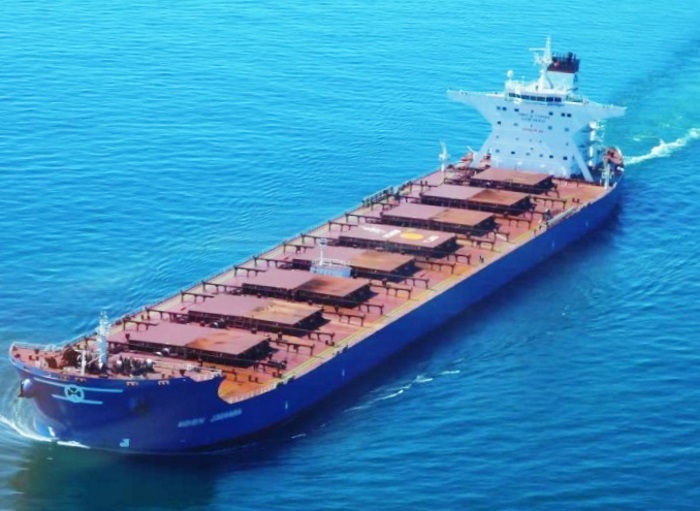 The dry bulk market’s fundamentals are still positive, given that during 2018 net fleet growth was quite low, at 3% despite the fact that demolitions stood at record low levels. In its latest weekly report, shipbroker Banchero Costa said that “in 2018, deliveries of dry bulk carriers over 20,000 dwt fell to its lowest in a decade, coming in at 266 units equivalent to 27.3 mln dwt. This compares to 427 units totaling 37.1 mln dwt delivered in 2017, and the previous capacity low of 22.7 mln dwt comprising 300 units in 2008. In terms of units, deliveries in the Supramax category (mostly Ultramaxes between 60,000-64,000 dwt) again formed the largest share of 29%, with 76 units equivalent to 4.7 mln dwt delivered. In deadweight terms, Capesizes formed the majority of 35%, counting 26 units totaling 9.5 mln dwt. Dry bulk demolitions in 2018 also fell to a record low of 41 units totaling 4.0 mln dwt, a sharp drop compared to 192 units equivalent to 13.6 mln dwt scrapped in 2017. 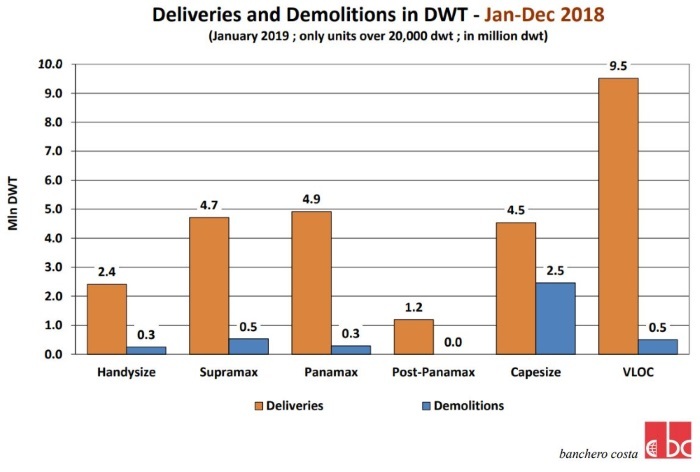 Capesize demolitions formed a majority of 37% and 61% in unit and deadweight terms respectively, with 15 units equivalent to 2.5 mln dwt reported scrapped. The average scrapping age in 2018 for dry bulk carriers was 27.7 years, with Panamaxes having the lowest average scrapping age of 22.5 years, while Capesizes came at a close 23.3 years”. The shipbroker added that “the dry bulk net fleet growth was 225 units totaling 23.3 mln dwt, representing a 3.0% fleet growth. Fleet growth remained relatively on par with the 3.2% growth seen in 2017, as both delivery and demolition activity slowed down immensely in 2018. In unit terms, Supramaxes, Handysizes, and Panamaxes saw the greatest net increase of 64 units, 59 units, and 57 units respectively. In deadweight terms, Capesizes saw the greatest net increase of 9.0 mln dwt comprising of 24 units. 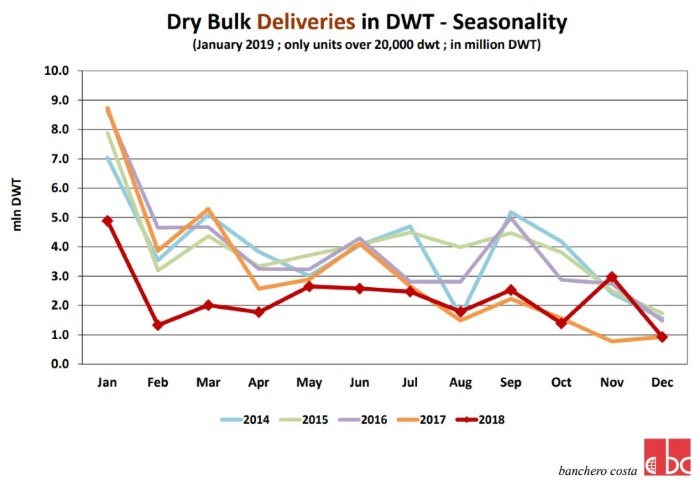 In 2019, after assuming a lower slippage rate of 25 percent based on improved freight rates and market sentiment, dry bulk deliveries are expected to increase to 37-38 mln dwt. Demolitions could see an increase this year after hitting a bottom in 2018, especially if complying with the Ballast Water Management Convention and upcoming IMO 2020 sulphur cap prove too costly. However, actual demolition activity would depend greatly on actual market performance, which could see an improvement this year as vessels are taken off the market for scrubber installation, but also faces the risk of dampened demand due to the U.S.-China trade war and slowing Chinese economy. Based on our current assumptions, the dry bulk fleet could grow around 3-4% this year”. Meanwhile, demand-wise, the shipbroker said that “China remains very much at the centre of the action, estimated to account for 70 percent of global iron ore imports. In comparison, iron ore imports by both Japan and Europe combined are estimated at 15 percent of the global trade. Chinese iron ore imports grew 4.9 percent in 2017 to 1.075 billion tonnes, supported by strong demand from steel mills. However, growth in China’s iron ore imports has slowed in the first 9 months of 2018, decreasing 1.7 percent year-onyear to 803.5 million tonnes, even as Chinese steel production surged and domestic iron ore output continued to fall. Chinese steel production has managed to reach monthly record highs since April, bringing total steel output in the first 9 months of 2018 to 691.2 million tonnes, a strong increase of 8.1 percent year-on-year”. Banchero Costa added that “domestic ore output over this period fell by a drastic 41 percent year-on-year as environmental and safety restrictions intensified. Even as official steel production data shows a strong increase, there is the possibility that China’s total steel production has actually fallen as illegal steel mills were shut, which could explain the rather flat iron ore import figures. The lower levels of iron ore imports could also reflect a combination of less ores required in steel making due to the usage of higher-grade ores, and some port inventory drawdown (also said to be of the higher quality ores as well). As China clamps down on environmental pollution, there has been increasing emphasis on the quality of raw materials used, resulting in greater popularity of higher quality iron ore imports from Australia and Brazil. Long haul imports from Brazil in particular could become an important driver of dry bulk freight rates due to their higher quality. The China Association of Metalscrap Utilization has also reported increased scrap used in Chinese steel making in 1H 2018, with 180 million tonnes in scrap usage estimated for the whole of 2018, compared to 148 million tonnes in 2017. Baoshan Iron & Steel Co, China’s largest listed steelmaker, as well as Australia’s Department of Industry, Innovation & Science have also alluded to the increasing usage of scrap steel in steelmaking due to the country’s growing stockpiles. Growing scrap steel supplies could encourage increased output from electric arc furnaces that use only scrap as raw material in China, which may challenge demand for iron ore in the long term”, the shipbroker concluded.